In late summer and early fall, when many sweeping contractors are out mowing and landscaping, the need for street sweeping seems to lessen, except for after parades and festivals. But for storm water pollution prevention, this could not be further from the truth. Most of the material removed during the spring cleaning season is sand. This sand typically is in the PM65 to PM250 size range and is not considered harmful to aquatic life. In the fall, sweeping stops decaying leaves from getting into the storm system and watershed. After spring cleaning and before leaf season, the streets appear to stay relatively clean. The debris on the streets typically is windblown dust from farming and construction activities, as well as powder ground off the pavement by traffic. When measured, this material can reach PM2.5 to PM10 in size. Although there seems to be less material in the summer, it can be much more harmful to aquatic life. It can fill storm drains and catch basins, make drinking water treatment more difficult, and destroy river habitats. These particles can stay mixed with water for an extended period and be ingested by animals, impairing their oxygen intake. 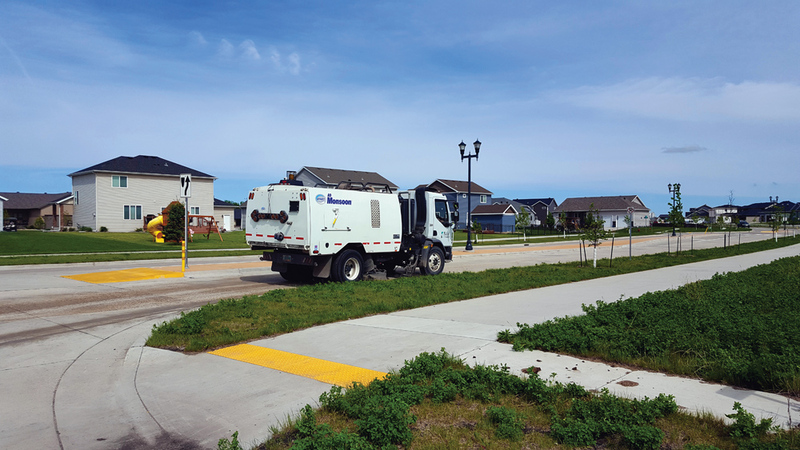 Street sweeping and catch basin cleaning are two common best management practices (BMPs) municipalities can use to manage nonpoint-source pollutants under a NDPES storm water permit. Many storm water professionals are aware that street and parking lot sweeping is a U.S. Environmental Protection Agency (EPA)-recognized storm water BMP, and many permit applications and plans specifically call for regular sweeping. Regenerative sweeping technology is efficient at removing the smaller material found in the summer. Regenerative air sweepers employ a closed-loop, cyclonic effect to clean. Like on a vacuum sweeper, a vacuum inlet is located on one side of the sweeping head. Unlike vacuum machines, however, regenerative air sweepers constantly internally recirculate their air supply. To accomplish this, the recirculating air is blasted into the sweeping head on the side opposite the pickup, or inlet, tube. Essentially, the air blasts down onto the pavement on one side of the head, travels across the width of the head, gathering debris with it as it goes, and then travels up the pickup hose on the other side with the debris. Manufacturers design their sweeping heads to swirl the air so it will retain the collected debris within the airstream as it moves from the blast side of the head to the intake side. The amount of pollutant-laden air exhausted by a regenerative air-based sweeper is minimal. Because of this, and the fact that regenerative-based machines also tend to pick up the small-micron particles across the entire sweeping head, regenerative air sweepers often are used where either air quality or storm water runoff are concerns. They also are versatile, as they can handle other material, from leaves and light paper to heavy construction cleanup. While getting the harmful small particles out of the watershed is the first step, it also is critical to keep these particles out of the storm water system. Avoid dumping these fine particles in piles where they can be rewashed into the watershed. Unlike the sand brought in from spring cleanup that will stay settled where it is put, the finer summer material should be covered, capped or separated from possible runoff areas by a 100- to 200-ft vegetation buffer that allows the material to stabilize and prevents it from floating off. Construction sites should be carefully managed to minimize pollutants. Although sites 5 acres or larger must have a storm water plan under NPDES Phase I, smaller ones that are below the NPDES radar can have a great impact. Construction studies have shown that if these sites do not control runoff, the sediment discharge would be 10 to 100 times greater than that of an undisturbed area. One way to prevent this is to stop construction vehicles, including personal ones, from tracking mud. Instead of putting trucks in the mud, contractors should lay down straw or scrap wood to prevent tracking mud. Sweeping intervals remain critical in terms of maximizing pickup of pollutants and debris. Some roads get cleaned twice a year, while others are cleaned daily. Determining cleaning frequency is a tricky business that depends on traffic volume, water volume and climate. Funding also may play a role. When sweeping for appearance’s sake, it makes sense to return to various streets on a regular basis, based on the volume of debris left on the road per day. In terms of water quality, the ideal timing for sweeping is not an interval at all. Small particles will remain largely unseen and are not a danger until it rains. If there is a trick to determining when to sweep, it is to accurately predict rain so the streets are all swept moments before the rain hits. Because this kind of prediction and speed are impossible, many look at biweekly sweeping as a limit before returns start to diminish. But in dry climates, it makes sense to sweep the quiet streets just twice a year. Wet, humid, temperate and cold climates have different needs and require different sweeping frequencies. Do not let your sweeper take the summer off and lose the storm water pollution prevention benefits from your sweeping program. Streets need sweeping to prevent storm water runoff pollution. Brian Giles is product manager for Schwarze Industries. Giles can be reached at [email protected] or 256.851.1133. Jim Adair is product manager for Schwarze Industries. Adair can be reached at [email protected] or 256.851.1230. Brenda Bell is customer service manager for Schwarze Industries. Bell can be reached at [email protected] or 256.851.1290. Greg Heyer is vice president of sales, marketing, customer service and product management for Schwarze Industries. Heyer can be reached at [email protected] or 678.899.3456.